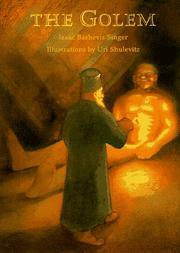 With more story, as well as more craft and substance, than in Beverly Brodsky McDermott's histrionic picture-book version (1976), this tells of Rabbi Leib of Prague and the golem he created to save a banker and other ghetto Jews from execution for false charges. The golem accomplishes the task he's charged with, but then refuses to bend down and allow the rabbi to erase from his forehead the name of God that gives him life. Because the rabbi has given in to his wife's pleas to use the golem for an unauthorized though charitable purpose, he has lost the power over his creation. Without dramatics, Singer makes a proper mythic melodrama of the early trial, bringing out the historical and elemental reality of the climate of injustice; and his account of the golem's subsequent misdeeds and confusion is all the more effective for reading like an unadorned record. This is strong material, and Singer shrewdly recognizes the psychological and philosophical reverberations without underlining, elaborating, or deviating from the straight account. (The only explicit speculation comes in the dosing suggestion that perhaps love--here the housemaid Miriam's for the golem--"has even more power than a Holy Name.") Shulevitz' black-and-white chiaroscuro illustrations, on the other hand, give the events a remote and serious look and emphasize the monumental lifelessness of the golem. One longs for a glint of life or expression somewhere--but the legend can support Shulevitz' approach.